I love Harriet Evans. Ever since I read 'A Hopeless Romantic' (and pretty much grinned all the way through it) I have kept an eye on her writing. So when I had the opportunity to review Happily Ever After, I was pretty thrilled. Eleanor Bee wants to work with books and when she lands a job working at a publishing house, she gets her wish. She also gets some other things that she didn't bargain for, including an affair with her boss, the man of her dreams. Sadly, Rory isn't quite the man she thought he was. Or perhaps it's fairer to say that he is the man she thought he was - but hoped he wasn't. I don't like spoilers so I'll try not to give too much way. Suffice to say that given that this is romantic fiction, there's a certain amount of prescriptive plotting: the misunderstandings, the rows that could so easily be averted, the 'one' who isn't the one, the 'one' who is the one but at the wrong time. 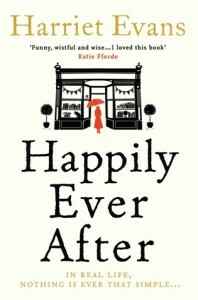 While Happily Ever After didn't leave me quite so gushing and warm inside as 'A Hopeless Romantic', nonetheless it was a wonderful read. At one point I really wasn't sure how it was going to end and wondered if I'd totally misread the cues. Thankfully I was left with the happily ever after that I wanted, albeit with a slightly more adult tinge than the fairy tales. Evans writes 'real life' romance at its best. It's gritty, not always straightforward, not always easy reading but always, always with something to make your heart flutter. I received a copy of this book in exchange for my fair and honest review. I did not receive any additional compensation. All opinions are my own.